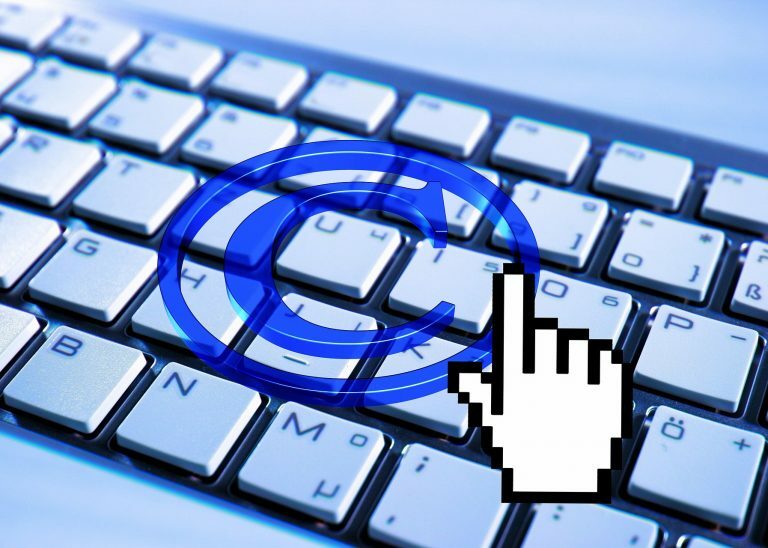 What commercialization strategies are available for my intellectual property? How do the IP strategies compare? Who is the most suitable partner for my innovation? Financial modelling allows you to project and visualize potential returns you can generate from your intellectual property. Financial modelling lets you create a present-day assessment of the potential value of your intangible assets based on multiple IP monetization strategies. Model visualizations, such as the graph below, allow for an in-depth study of your year-to-year projected returns based on multiple scenarios. These graphs are supplemented by key model metrics which allow comparisons between different valuation models. These outputs can be used for a variety of purposes including understanding the potential future value of your intangible assets and supporting strategic decisions concerning your IP, particularly if you are considering an IP asset transaction. However, the value of a financial model does not have to be constrained to a single valuation. It can be more powerful than that. A dynamic model can be used as a tool during licensing and/or sale negotiations. Having a financial modelling tool is highly desirable when exploring monetization strategies and understanding potential outcomes. 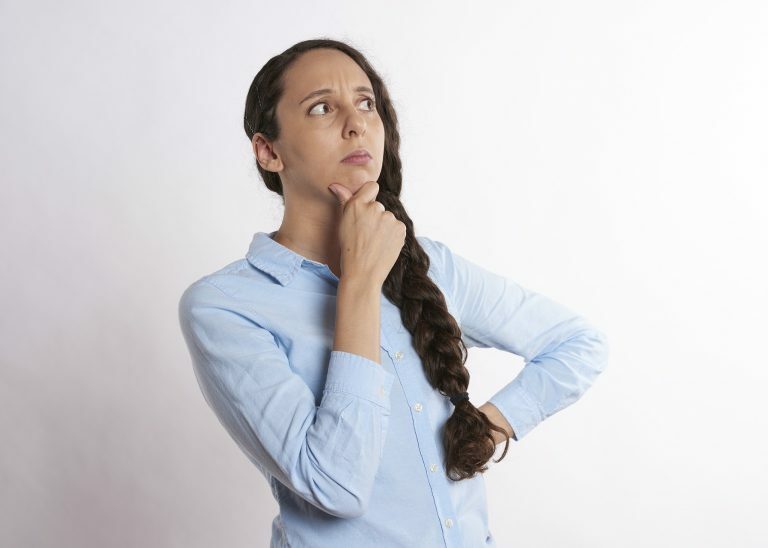 For example, in a licensing negotiation if you know the sensitivity of the royalty rate on your cash flow, the impact of milestones on your revenue, and when you can expect to pay back your investment, you will be in an advantageous position. You will have an idea of the preferred deal structure, have better-defined goals and know where concessions can be made and where you must hold your ground. Ultimately, this could lead to a better financial outcome for your company. Above is a sample output from a ClearViewIP interactive licensing model. 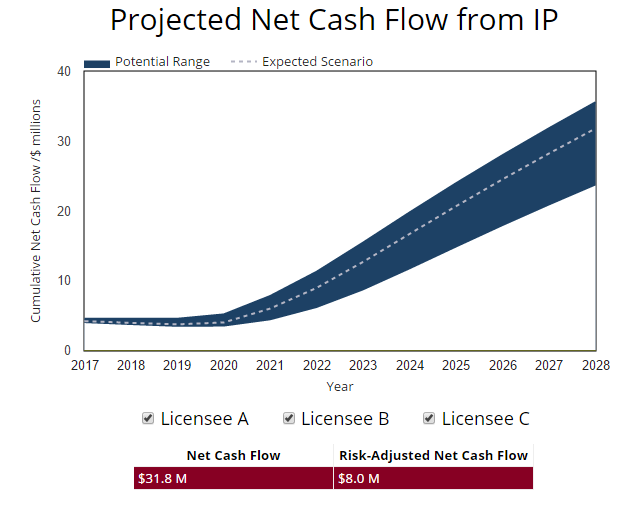 The plot shows the cumulative projected cash flow from a company’s IP. Most variables in the model are specified with a single number. However, a small number of variables, including the royalty rate, are modelled with high and low values to represent the best- and worst-case scenarios respectively. Modelling all scenarios results in upper and lower bounds for the projected revenue. This is illustrated as a shaded, bounded region in the chart. Provided a licensing agreement is signed, the potential revenue should lie in this region. The dashed line is the most likely ‘expected’ scenario. This chart is based on a model which is dynamic, as is the case for the models delivered by ClearViewIP. As such, different licensing partners can be turned on or off by ticking or unticking the boxes above in the graph. In doing so, you can see what effect negotiating licenses to licensees A, B and C has on the projected revenue. Below the graph, a table with the cumulative cash flow and the risk-adjusted cash flow are shown. Each strategy has an accompanying risk associated with it. For instance, in this case it is perceived to be more likely that one or two licensees sign an agreement in comparison to all three licensees. For each case, the perceived risks translate into a success factor which suppresses the cash flow, giving the “risk-adjusted net cash flow” shown. This value is used as a comparator between licensing deals and between different strategies. When would you use a financial model in your IP strategy? ClearViewIP is often asked to assess the commercialization options for our clients. For this example, the client had a patented invention and wished to know how to exploit their IP to maximize their return on investment. In collaboration with the client, ClearViewIP investigated three options: an exclusive global license strategy, the sale of the company’s IP and a joint venture. An IP valuation model was created for each strategy. The models were customized to match the client’s requirements and preferences. Information was collated from the company’s employees and supplemented by market data from other sources. Variables in the models were assigned values on the basis of that information. ClearViewIP directors and consultants also contributed their knowledge of comparable deals in the industry to better define parameters such as the royalty rates and milestone payments. The models were used to inform the company which strategy could potentially result in the highest return. ClearViewIP provided a detailed step-by-step implementation plan for the strategy. 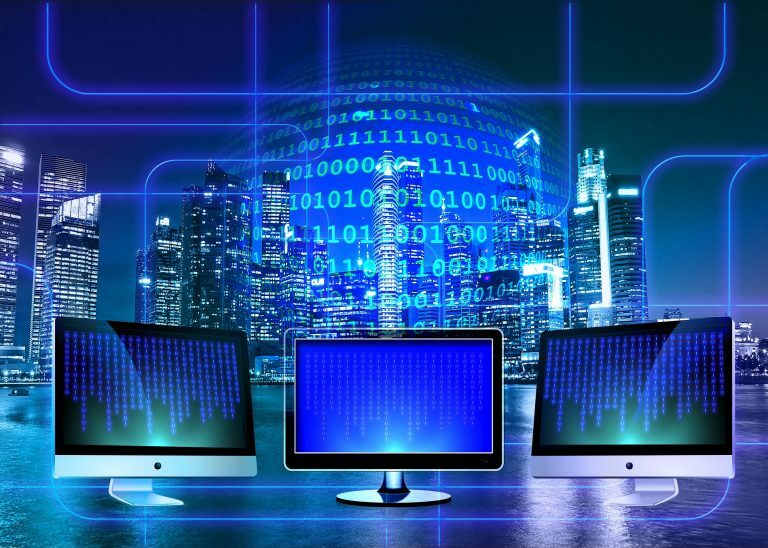 Having received ClearViewIP’s advice, the company decided to pursue the recommended strategy and recognized the potential of the dynamic model that was supplied to them going forward. What is the IP valuation modelling service delivering? Based on the questions you’re trying to answer, ClearViewIP provides custom-built, dynamic, IP valuation models to help get you closer to understanding the licensing scenarios available to you. This maximizes the usefulness of the deliverable for you and ensures the valuation is as accurate as possible. These are the types of questions that can be answered with the help of ClearViewIP’s financial modelling service. How much revenue can I expect to achieve in 10 years’ time if I license my IP? How much will I need to invest in my IP? When can I expect to recoup my investment? My IP is being infringed. What are the damages I am owed? Financial modelling – a dynamic model is created for each strategy to qualitatively assess each option.